Rosetta, a European Space Agency spacecraft, has successfully “phoned home” after a 957 day “hibernation” period which allowed it to sync paths with comet 67P/Churyumov-Gerasimenko (67P for short). 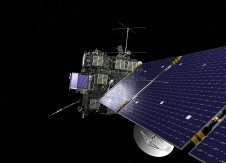 Rosetta aims observe 67P over an extended period of time rather than the quick fly-byes of its predecessors. In this way the ESA in collaboration with NASA hopes to discover more about the life cycles of comets which melt as they approach the sun and grow, gathering ice and space dust as it launches back on its orbit into space.